Unlike its predecessor we only have 10 pay lines here over the 5 reels and 3 rows and all the symbols are fully stacked. Secondly, the game has 'adjacent pays' meaning that 3 consecutive symbols on any pay line award the win, whether 1, 2 and 3 or the centre 3 reels or last 3 reels. The game's title icon is the highest-paying 5-of-a-kind at 40x bet followed by Hansel and Gretel at 10x. The lower icons are all coloured gemstones paying 4x stake for the 5. Fairy Wonder Spin - she will turn 5-9 tiles into the highest title icon before the remaining reels stop. Fairy Surprise - you only get this after a losing spin, and she will select a symbol at random. Starting with the lowest other symbols will transform to match until a win is awarded. 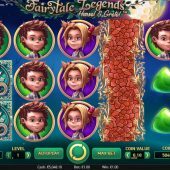 Fairy Wild Spin - any one or two of reels 1, 2, 4 and 5 will become a stacked Wild and and wins will be paid, then you get a respin with them held in place. Candy House Bonus - there will be a house in the forest covered with 15 sweets. You pick 3 and the values aren't revealed but before they are you opt for either the average value of the 3 or pick one and take that. It may or may not be the highest and the values range from 1 to 120x bet. Coin Win - an annoyance to any player when wanting free games or something exciting after waiting to trigger the feature; you get a staggering 15x bet. Free Spins - 10 free games where the enhancement is that now stacked Wilds also appear on the end reels as well as 2 and 4. You can retrigger them and also get 2 extra spins for 1, and 4 extra spins for 2 chests appearing. As in the base game, any stacked Wild(s) offer the respin. 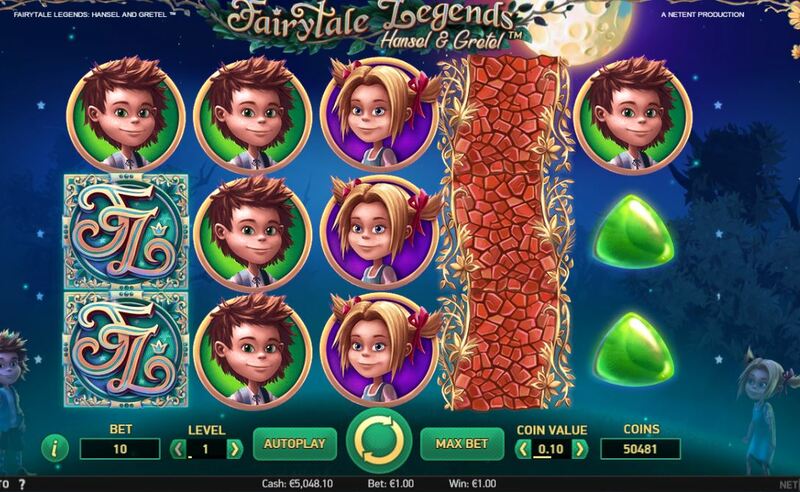 Fairytale Legends Hansel and Gretel slot is actually quite a decent game with good mechanics and frequent in-play features and a high win frequency of which some can be quite good. The two negatives are surely the graphics/theme which are a bit too juvenile in my view and of course the dreadful outcome of the 'coin award' when triggering a feature which is a let-down on any slot, most notably their Guns n' Roses game and Microgaming's Tarzan. Why developers make you wait for a feature and then potentially 'reward' you with a win they could just have easily dropped in via the reels on any spin, is beyond me! The RTP is a very decent 96.71% and you have the quite common Netent maximum pay on a spin of 400x bet. So, like Hansel and Gretel, will you follow the trail of breadcrumbs to this slot?